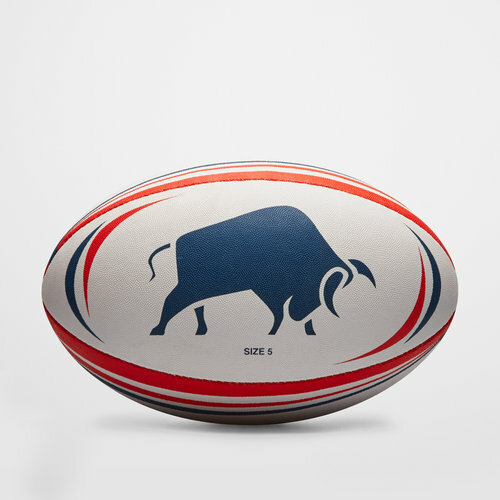 The perfect item to take to the park for some you time... the Raging Bull Graphic Rugby Training Ball. This rugby ball is the perfect gift or the perfect item to take to the park to practice your catching, passing and kicking skills. This ball uses a technical latex bladder providing greater elasticity and longer inflation. The all-weather superior grip allows this ball to be used in all weather conditions so there is no need to fear a slip with the wet & dry grip that this ball affords. This ball is white with red and navy tones running around the outside. The Raging bull logo can be seen in the centre.